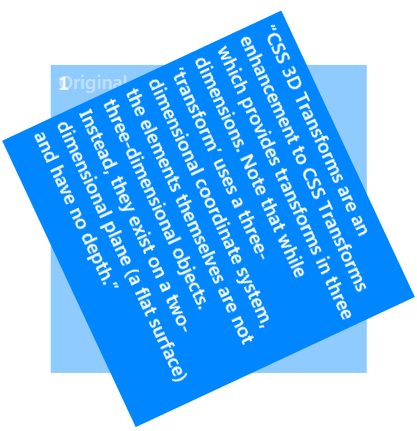 Note It is a good idea to become familiar with transform coordinate systems and rendering before attempting to specify 3-D transforms manually. Indicates the transform functions (listed in the following section) to be applied to the specified element. The transform property can either be set to a space-delimited list of transform functions or to the none keyword, which indicates no transform functions are applied. Remember that order matters! Transform functions are applied in the order they are listed within the transform property. Also, the effects of functions with a z-axis component are most evident when used in combination with the perspective function, which gives them depth. In the markup samples and images that follow, the perspective function and others have been added to the transform property to make the effect of the illustrated function more obvious. You are encouraged to see the effect of different function and value combinations by trying out the Hands On: 3-D Transforms demo on the IE Test Drive. The perspective function changes the perspective through which an element is viewed, giving an illusion of depth. As the value supplied to the perspective function increases, the further away from the viewer the element will appear. The value must be greater than 0 and is given in pixels. The units of <length> are the same as supplied to any of the translation functions—that is, 1px in the z-direction is the same distance as 1px in the x- or y-directions. The matrix3d function specifies a 3-D transformation as a 4×4 homogeneous matrix of sixteen values in column-major order. 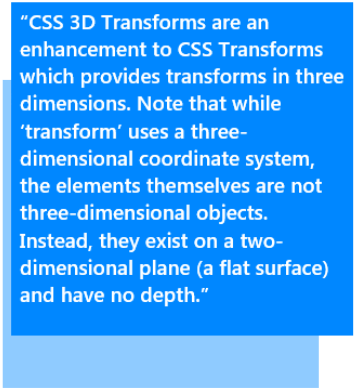 All other transformation functions are based on the matrix3d function. The translate3D function specifies a 3-D translation by the vector [tx,ty,tz], where tx, ty, and tz are the first, second, and third translation-value parameters respectively. The translateZ function specifies a translation by a given amount in the z-direction. Percentage values are not allowed. The scale3d function specifies a 3-D scale operation by the [sx,sy,sz] scaling vector described by the three parameters. The scaleZ function specifies a scale operation using the [1,1,sz] scaling vector, where sz is given as the parameter. The effect of the scaleZ function is most evident when used in combination with functions such as the rotate and perspective functions, as shown in the following example. The rotate3d function specifies a clockwise 3-D rotation. The element rotates by the angle specified in the last parameter, and about the [x,y,z] direction vector described by the first three parameters. If the direction vector is not of unit length, it will be normalized. A direction vector that cannot be normalized, such as [0, 0, 0], results in no rotation. The rotateX function specifies a clockwise rotation by the given angle about the x-axis. The rotateY function specifies a clockwise rotation by the given angle about the y-axis. The rotateZ function specifies a clockwise rotation by the given angle about the z-axis. The transform-origin property establishes the origin of transformation for an element. For instance, if you specified the rotate3d function in the transform property, this property would define the point around which the element would rotate. The default value of this property is "50% 50% 0px" (the middle of the element). The first length value specifies the position on the x-axis relative to the element's containing box. It can be a length value (in a supported length unit), a percentage, or one of the following three keywords: left (indicating 0% of the length along the x-axis of the containing box), center (indicating the halfway point), or right (indicating 100% of the length). The second length value specifies the position on the y-axis relative to the element's containing box. It can be a length value, a percentage, or one of the three following keywords: top (indicating 0% of the length along the y-axis of the containing box), center (indicating the halfway point), or bottom (indicating 100% of the length). The third length value specifies the position on the z-axis relative to the element's containing box. It must be a length value. 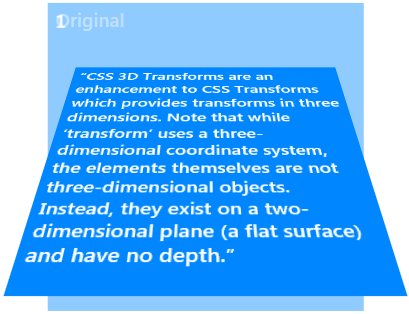 The transform-style property defines how nested elements are rendered in 3-D space. 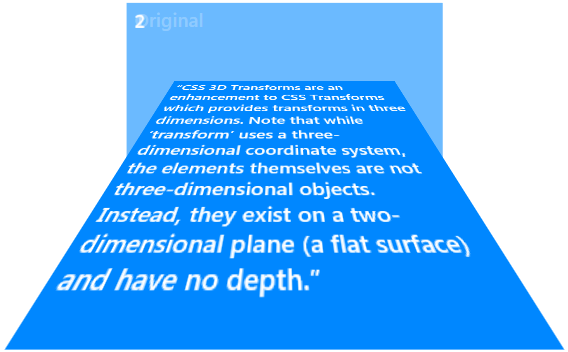 Defines how nested elements are rendered in 3-D space. If you set this property to flat for an element, all of its child elements are rendered flattened into the 2-D plane of the element. Rotating the element about the x- or y-axes will cause children positioned at positive or negative z-positions to appear on the element's plane, rather than in front of or behind it. 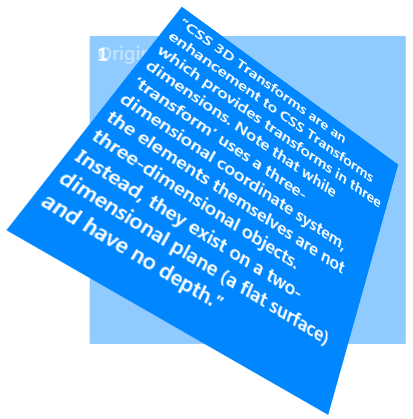 As of Microsoft Edge, the preserve-3d value is supported. The preserve-3d value allows elements to be positioned in 3-D spaced, instead of being flattened. 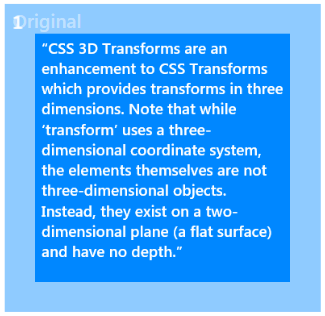 The example below shows how nested 3-D transforms are rendered when transform-style is set to flat. 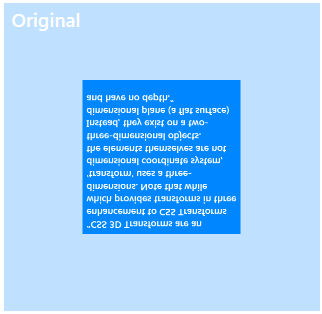 The blue element is rendering with the perspective that is applied to its parent element. 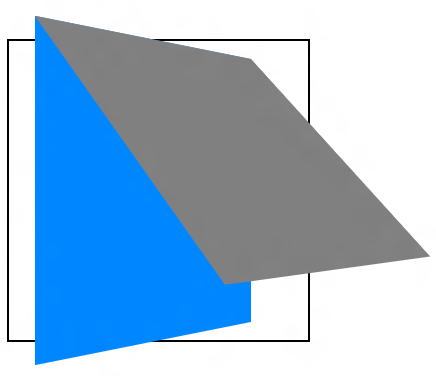 The gray element is rendered into the plane of its parent, the blue element, because it is not a member of a 3-D rendering context. The gray element is being flattened. 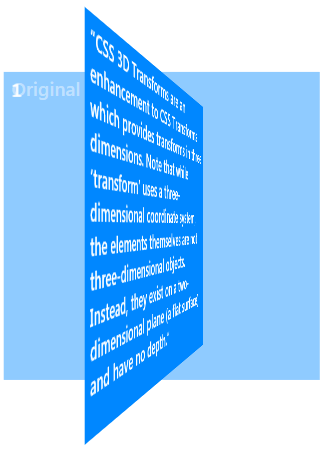 If transform-style is set to preserve-3d in the same example, the results would look like the following image. 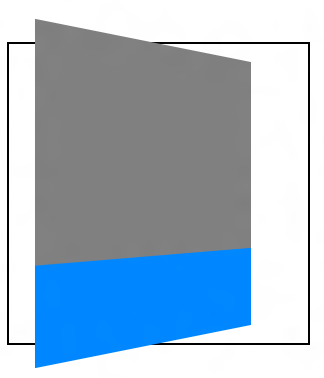 The blue element establishes a 3-D rendering context, and the gray element is a member of it. Because both the blue and the grey elements share a common 3-D space, the gray element renders as tilting out from its parent. The perspective property applies the same transform as the perspective transform function, except that it applies only to the positioned or transformed children of the element, not to the transform on the element itself. Applies the same transform as the perspective transform function to the positioned or transformed children of the element that the property applies to. This property can be set to a number, which establishes a stacking context and a containing block, or to the none keyword, which indicates that no perspective transform is applied. The perspective-origin property establishes the origin for the perspective property. The backface-visibility property indicates whether the "back face" (reverse side) of a transformed element is visible when facing the viewer. With an element that is not transformed, the front side of the element faces the viewer. Indicates the reverse side is visible. Indicates the back side is not visible.